Netflix updated its Android TV app today to version 3.0 with a new feature users have been wanting for quite some time. That feature is support for voice search. 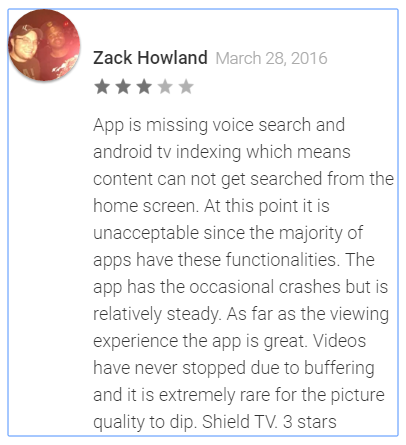 Prior to the update voice search on Android TV would not yield any results for Netflix content. That sucked considering a larger percentage of shows that many users watch are on Netflix. This guy was unhappy about it. Thanks for listening to Zack and fixing that Netflix. The update also touts performance enhancements with navigation and playback being better optimized for the Android TV platform. The new software will be rolling out to Android TVs over the next few days. If you're not the patient type you can download the APK here and side-load it. That's all guys. Now get back to binge watching House Of Cards. Looks like I was hasty in my assumptions. After reading the changelog again (more carefully) it would appear that voice search is limited to within the Netflix app itself. Sorry Zack you are still going to be unhappy. • Voice search capability. Press the microphone button on your remote control while in the Netflix application and search for your favorite show or actor. Support for this feature is being rolled out slowly and not available immediately on all devices. • Performance enhancements. Navigation and Playback are now better optimized for your Android TV device.